L.O. 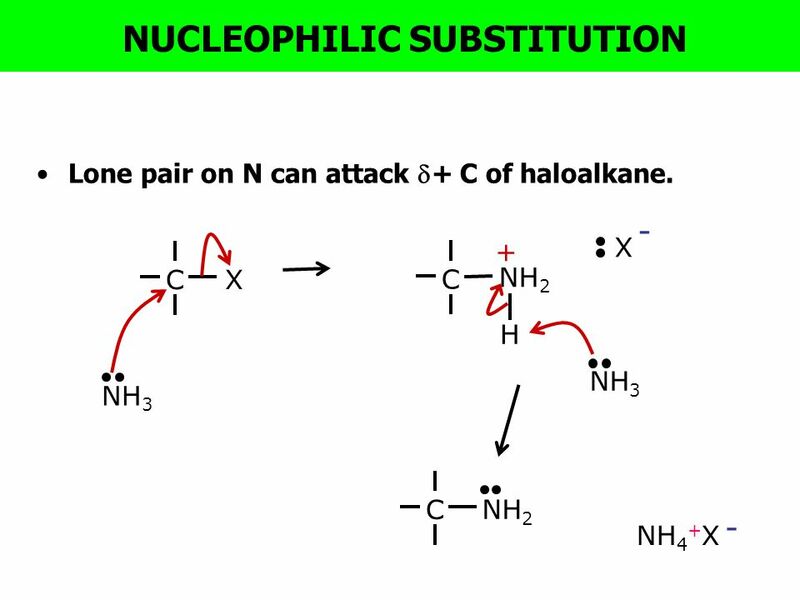 : Understand the reaction of amines and ammonia with haloalkanes. 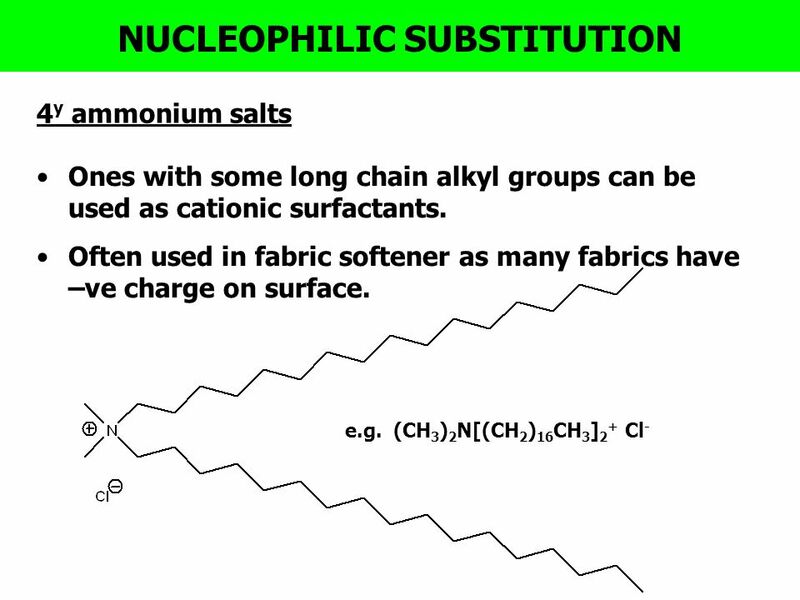 Know one application of quaternary ammonium salts. Know how amines can be prepared from nitriles. Know how aromatic amines can be prepared from nitro compounds. 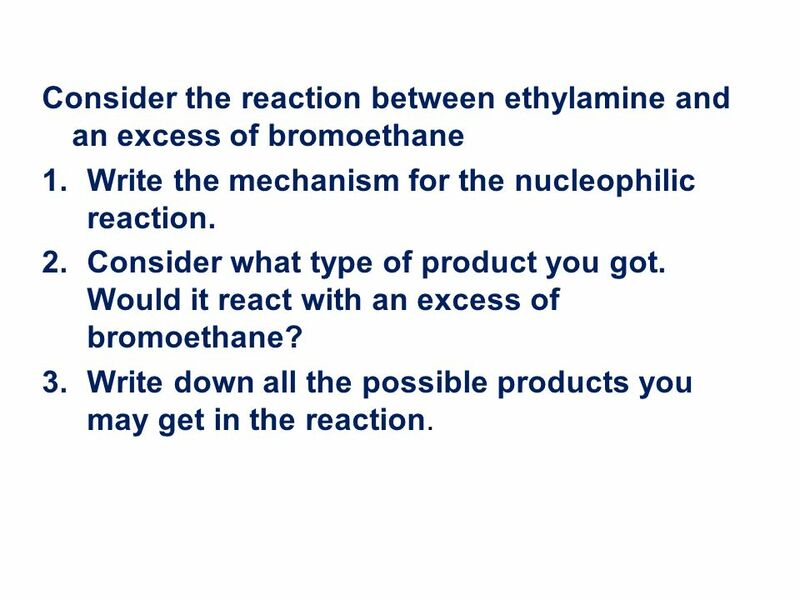 Write the mechanism for the nucleophilic reaction. Consider what type of product you got. Would it react with an excess of bromoethane? Write down all the possible products you may get in the reaction. 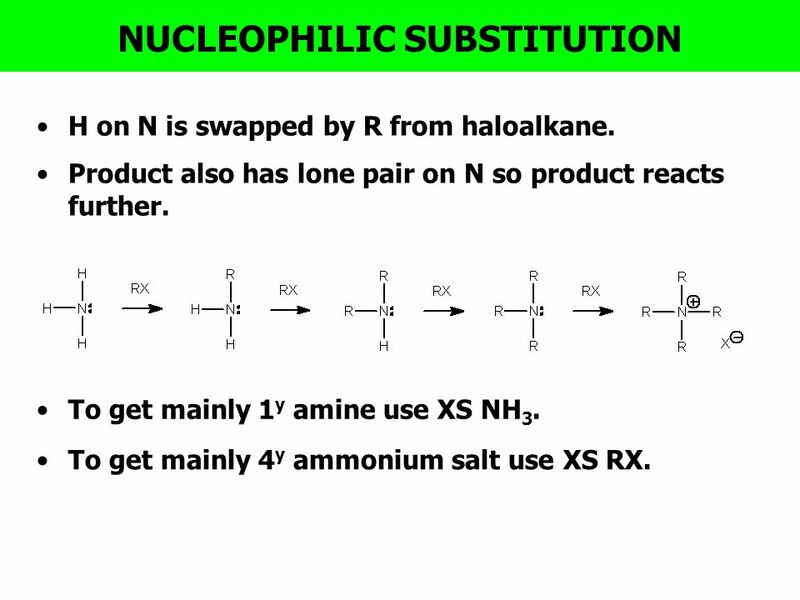 PPT - Amines 25/03/2017 H on N is swapped by R from haloalkane. Product also has lone pair on N so product reacts further. 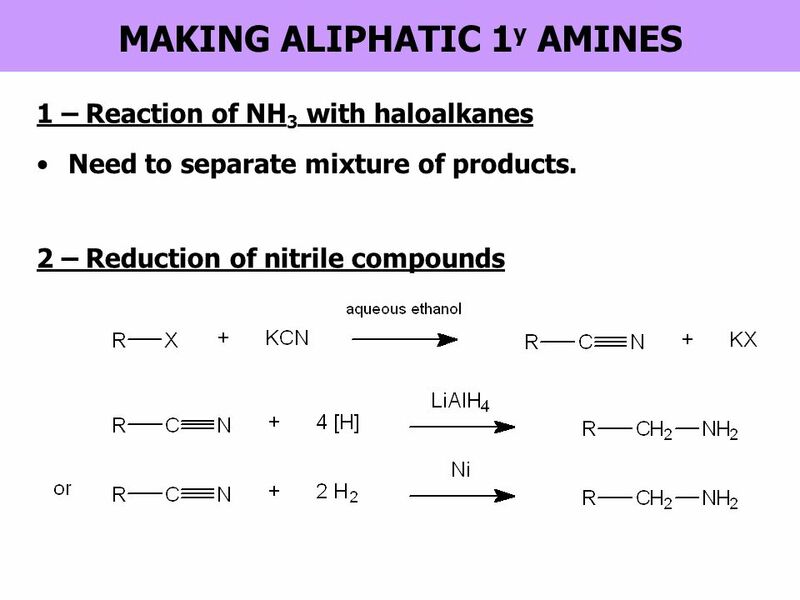 To get mainly 1y amine use XS NH3. To get mainly 4y ammonium salt use XS RX. 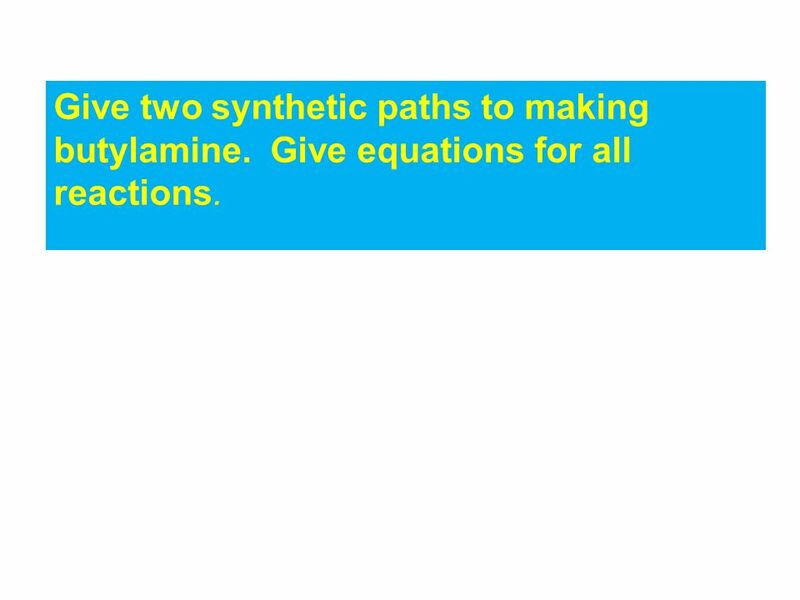 Give two synthetic paths to making butylamine. Give equations for all reactions. Download ppt "Amines as nucleophiles and their synthesis"
Chemistry of Nitrogen-containing Organic Compounds FSF = Full Structural Formula. Amines Ammonia derivatives. Specification from OCR o Explain the basicity of amines in terms of proton acceptance by the nitrogen lone pair. o Describe. 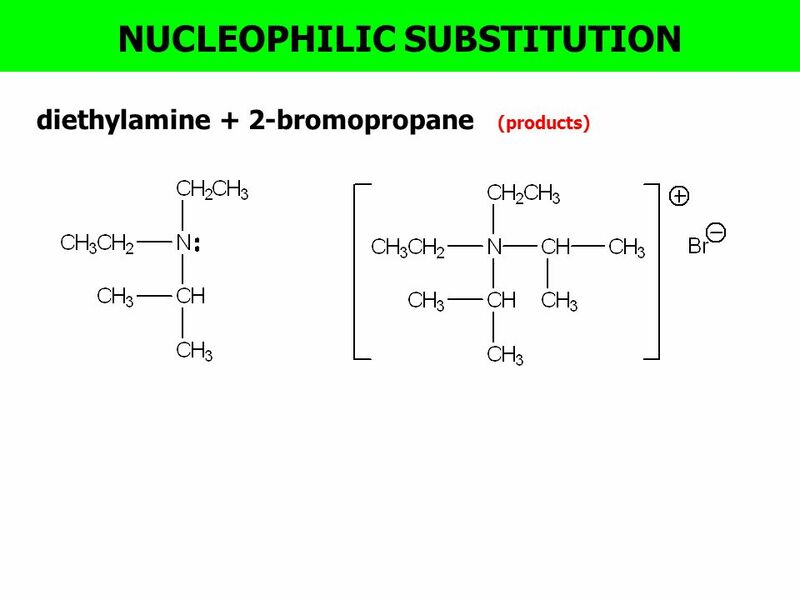 23-1 Preparation  We have already covered these methods nucleophilic ring opening of epoxides by ammonia and amines. 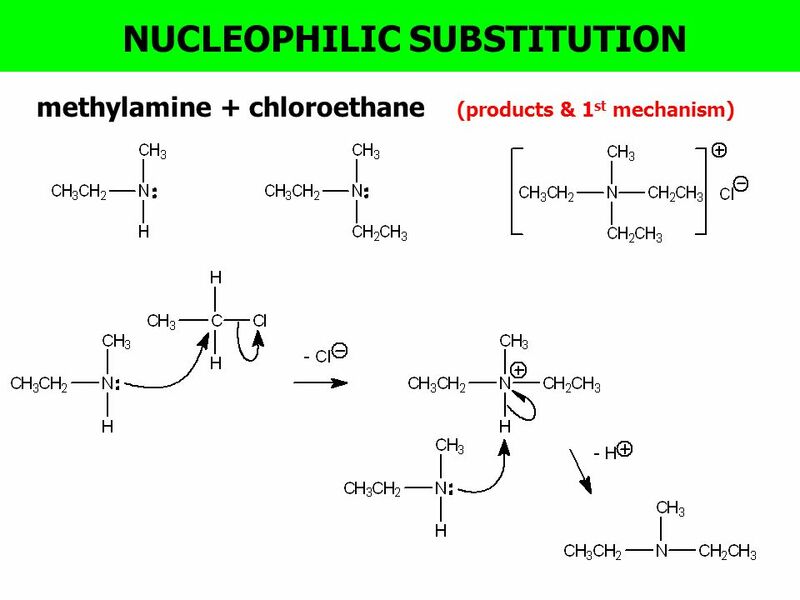 addition of nitrogen nucleophiles. 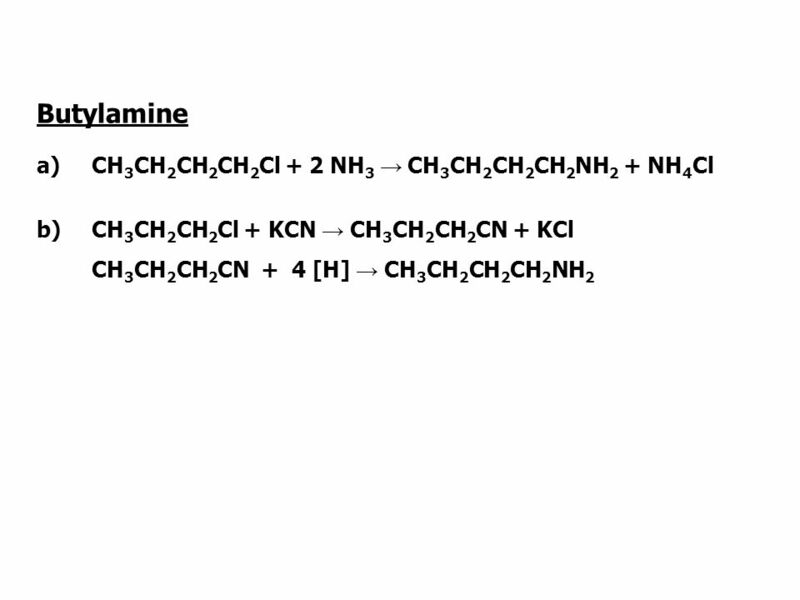 Dr. Wolf's CHM 201 & Reactions of Amines: A Review and a Preview. Week 6 © Pearson Education Ltd 2009 This document may have been altered from the original Describe the preparation of aliphatic amines by substitution. Chapter 11: Amines and Related Nitrogen Compounds The painkiller morphine is obtained from opium, the dried sap of unripe seeps of the poppy Papaver somniferum. 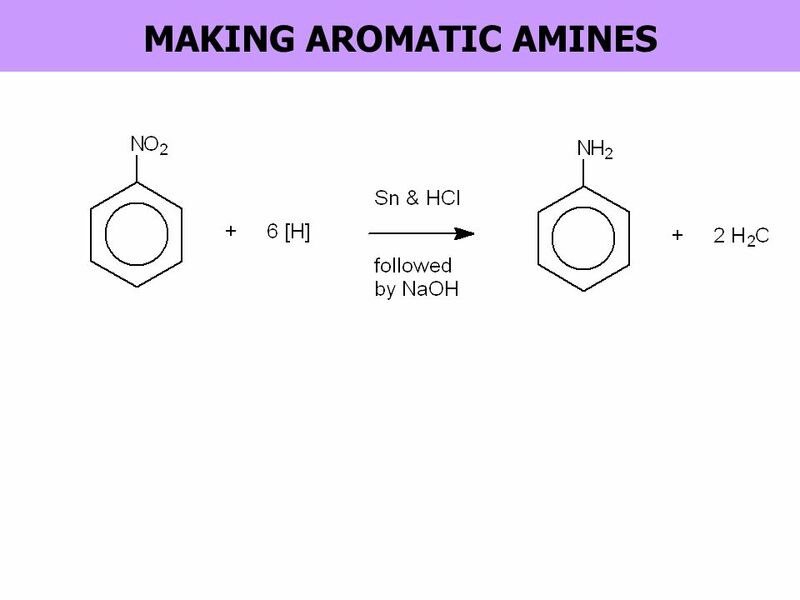 Properties of amines. Amines are compounds based on an ammonia molecule (NH 3 ), where one or more of the hydrogen atoms is replaced by a carbon chain. Physical Properties of Haloalkanes 6-1 The bond strength of C-X decreases as the size of X increases. A halogen uses a p orbital to overlap an sp 2 orbital. 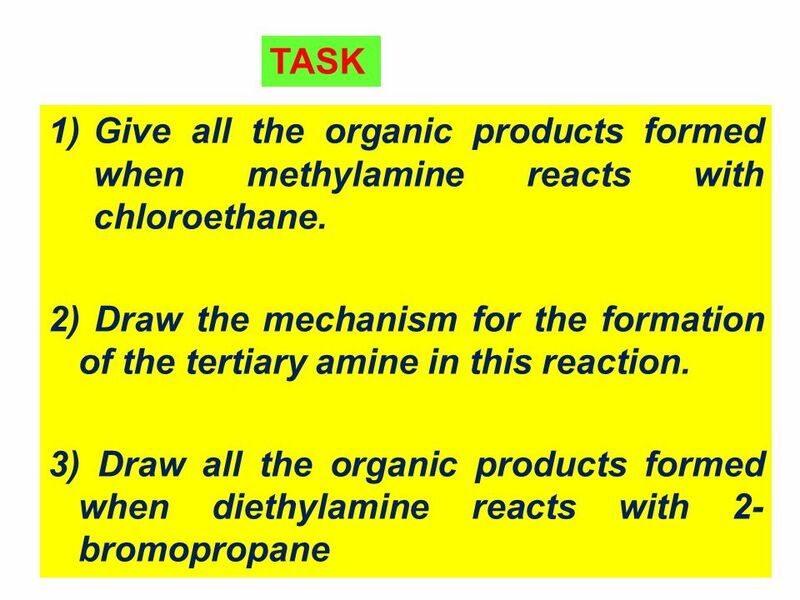 Chapter 19 AMINES PROBLEMS 2a,b,e,3a,b,c,6a,c16b,c,17a,c,20b,d21b, 25a,c,e,g,26a,c27b,36a,b,37ab,41c,d,I, 42a,b,c44a,c,g INTRODUCTION Organic derivatives. Nitrogen Compounds Aims: To know that these include amines, amides, nitro compounds, nitriles and amino acids. 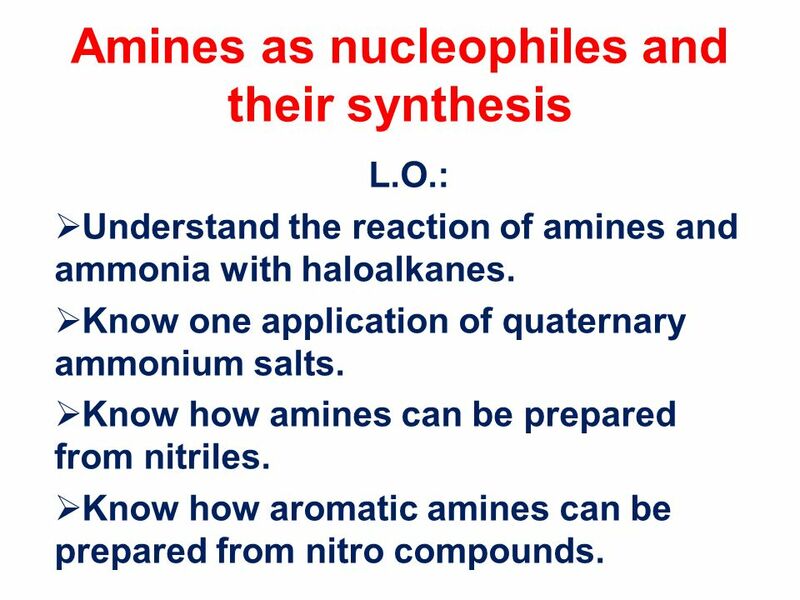 To know that amines are derivatives of ammonia. Dr. Wolf's CHM 201 & 202 22-1 22.6 Reactions of Amines: A Review and a Preview.